Uniqueness: How real is your personal brand in this global marketplace? 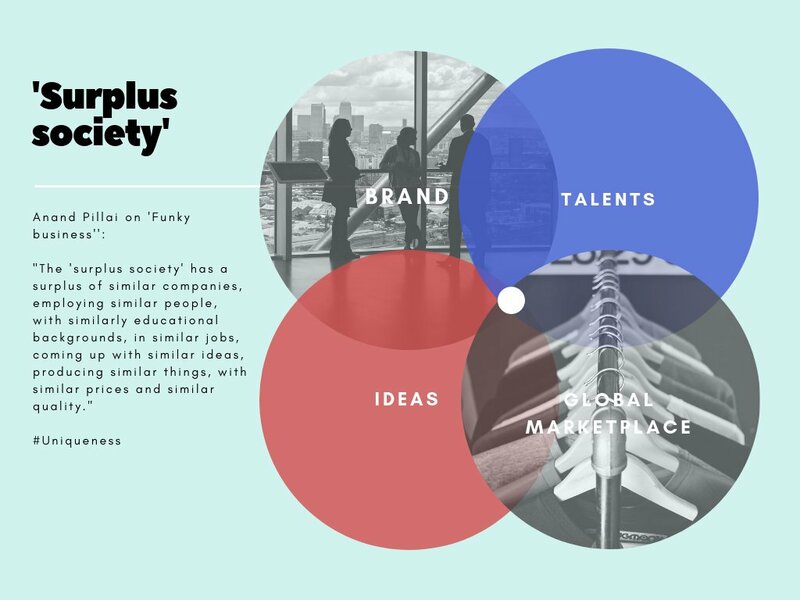 What makes you unique in this global marketplace? “Do you love your company? Do you love your colleagues? 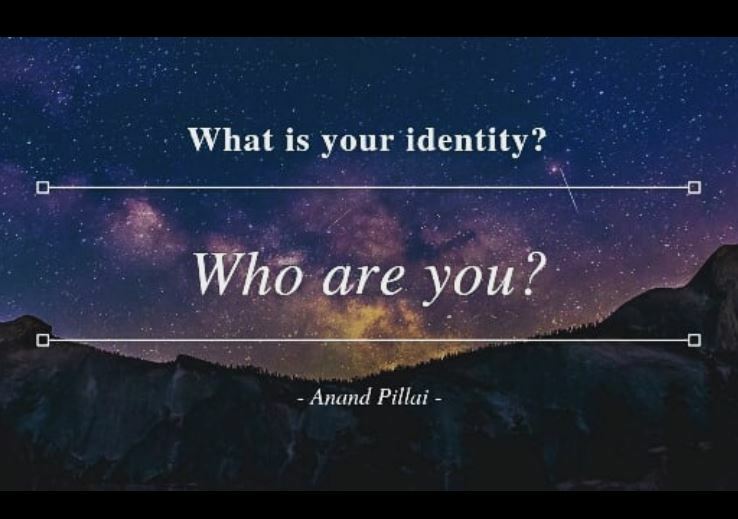 I am reflecting on these questions thanks to a TEDx talk by Anand Pillai on personal brand which introduced me to Jonas Ridderstrale and his book ‘Funky business‘. “… Power is transferred from producers to consumers… It will become much more difficult for any company, in any industry, in any part of the world to make money… Margin will become salami thin in most industries. So, how do you make money in such a world? Making money is a question of developing and implementing an absolutely unique recipe. Competition in this day and age is recipe based. Over time, we developed a market for technology, we can license in and license out on technology, all of it became necessary but no longer sufficient for the creation of a sustainable, competitive advantage… Of course, there are exceptions extreme high-tech, pharmaceuticals but in general today, technology is necessary but not sufficient. Instead, we started competing on organisational and managerial innovations… Management by objectives, Six Sigma, ISO 9000, ISO 9001, ISO 9003… For a short time in time or space, these innovations enabled a number of companies to deliver a blow to Toyota of Japan, General Electric of the USA. In fact, many of you are working for companies that are truly great at playing this managerial and organisational game. That is the good news. The bad, today, McKinsey and company exists, Accenture exists, Boston Consulting Group exists… aided by this cadre of global consultants, I promise you that all your competitors, even those in Tibet, are reengineering, reorganising , restructuring , managed by the same cadre of globally stantardized MBAs; mediocre but arrogant people. I work at a business school… and most business schools throughout the world share a dirty little secret: We all use the same darn books… It does not matter if you get your MBA in Boston, Birmingham or Bombay, same darn books. And then, you are supposed to make a difference. Yeah, good luck! What is the fabric of the contemporary temporary monopolies? How do we create sustainable competitive advantages in a world where markets are saturated? How do we create competitiveness in a world of man and markets? How do we create competitiveness in a world where we have given up on the principle of nurture and where we are now applying the laws of nature in business? You exploit the imperfections of man, the fact that man we have moved from a world of collectivism into a world of individualism. In business, we talk about competition on models, business models or competition on moods, emotional business. The business model of the past, the vertically integrated companies that dominated for some one hundred years, this was a great model in an information desert when information was a scarce resource, this made sense. But today we are facing a totally different ballgame. All the pieces, all the activities that were once kept internally, can now be bought on global and high efficient markets. We have to think of strategy from scratch. We have to focus on a limited number of things where we happen to be world-class! I believe that IT is necessary but not sufficient in the creation of continuous competitiveness. One hundred years ago, it was call electricity, a very smart way of transporting energy. Today, it is called the internet, a very efficient way for transporting information. It is the business model that you can plug IT into that is so critical. Competing on models is essentially a question of looking for similarities within a group of customers. Competing on moods is very much about the opposite. It is a question of thriving on differences. And human beings especially in an age of endless choice will be different. Now, it takes some times in business communities to realise that. I mean, it took the automative industry close to one hundred years to realise that women are not small men. Major revelation in the automotive industry. Exploiting the imperfection of man is a question of practicing emotional business not rational business. The economy of scale, size is critically important, the new name of the game is economies of soul and soul is not a question of more logic or reason, no, soul is a question of affection, intuition, desire and lust. Mood competitors face the challenge of providing the consumer with an emotional experience. “What we sell is the ability for a forty three years old accountant to dress in black leather to ride throughout small towns and have people be afraid of him”. Emotions lead to action. Logic to conclusions. Do you love, not like, not fancy, do you love your organisations? Do you love your products and services? And do your customers love you? Today, innovation is a question about being the creator of the value creating network including suppliers, customers. Innovation is no longer only a question of a product but of the product and the service and the experience. The entire innovation landscape is reshaped by entrepreneurial and successful companies. Model or mood ? Well in fact, you have to do both. I am the best person in the world at exactly one little thing, being myself. So, as a company, are you building this process of releasing the uniqueness of each individual in your team? In a city like Brussels which brands itself as the ‘second most cosmopolitan city in the world’, how diverse is the makeup of your ‘Chiefs’ selecting the ingredients and cooking your recipe for success? If homogeneous, which obstacles do you face?